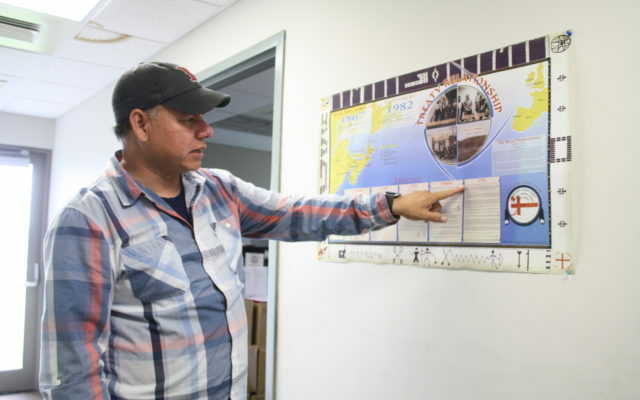 1776 treaty with Micmac, Maliseet tribes had big impact on future of U.S. When people ask Edward Peter-Paul to name a significant fact about the history of the Aroostook Band of Micmacs, the first thing that comes to his mind is the Treaty of Watertown. PRESQUE ISLE, Maine — When people ask Edward Peter-Paul to name a significant fact about the history of the Aroostook Band of Micmacs, the first thing that comes to his mind is the Treaty of Watertown. On July 19, 1776 — 15 days after the signing of the Declaration of Independence — seven delegates from what was then known as the Micmac Tribe of Indians and three delegates from the Houlton Band of Maliseets — who were known at the time as the St. John’s Tribe — met with the state governors of Massachusetts to sign a treaty that symbolized an “alliance and friendship” between the tribes and the state. The Treaty of Watertown was the first treaty that the U.S. signed after declaring independence from Great Britain. During that time, the Revolutionary War was in full swing and the land that people know today as the state of Maine was still part of Massachusetts. The U.S. Continental Army, led by George Washington, believed that in order to secure the northern border they would need the help of the Micmacs, who had long since lived in Quebec, Nova Scotia, Prince Edward Island, Newfoundland and in the most northeastern part of the U.S. The Treaty of Watertown stated that both tribes would provide Washington’s army with “600 strong men. . . . or as many as may be” and that they and the state of Massachusetts would respect one another’s physical jurisdictions. The treaty has an especially personal significance for Henry Bear, Maliseet tribal representative to the Maine House of Representatives, who is a descendant of Ambrose Bear, the Maliseet chief who participated in the weeklong negotiations of the treaty. Ambrose Bear served as the commanding officer for the Indian Detachment of the U.S. Continental Army. In 1777, he brought 400 Maliseet troops in over 100 canoes to Machias, where they helped defeat the British army during a battle that is credited with saving the entire coastal region of Maine for the U.S. His troops, which also included a 200-canoe fleet of Micmac soldiers, also defeated the British at Fort Cumberland near Halifax, Nova Scotia. Through the years, Bear has sought to honor his Maliseet ancestors by advocating for his tribe at the state government level. In 2013, he sponsored a bill in the Legislature that allowed Maine to formally recognize the Treaty of Watertown for the first time as a state. He also advocated for and successfully saw the passage of LD 245: “An Act to Rename B Stream in Houlton as Captain Ambrose Bear Stream” in 2015. “I currently live just a few hundred meters from where he camped some 240 years ago along the stream that bares his name in Houlton,” Henry Bear said about Ambrose Bear. Peter-Paul noted that the story of the Treaty of Watertown became mostly lost to the general public through the years as the state of Maine did not enact legislation to mandate the teaching of Native American history and culture in schools until 2001. But even then, he said, the legislation did not guarantee that all schools would have funds to implement the coursework. Peter-Paul himself did not know about the treaty until after he became tribal chief for the Aroostook Band of Micmacs in 2013. Since then, he has done more research on his own about the treaty and is now more confident that its story will not be lost among younger generations of Native Americans in Aroostook County. The Treaty of Watertown might not be “celebrated” in the same way that the country celebrates the Fourth of July or the famous Declaration of Independence, but Peter-Paul believes that the Treaty of Watertown is equally as important 242 years later because of the role it played in ensuring that the U.S. remained independent.